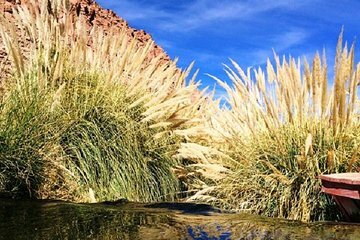 Enjoy the unique experience of bathing in the rejuvenating waters of a natural thermal bath on this day trip from San Pedro de Atacama. Don't worry about transportation, simply board the comfortable minivan at your hotel and relax on the short journey to the Puritana River, 3,500 meters high in the Andean Altiplano. Sink into the thermal waters that flow at a temperature of 92.3 F (33.5 C) while soaking up the surrounding scenery.